The President of the Network of Women Parliamentarians, MP Rahantasoa Lydia, praised EISA Madagascar for the work it had done to improve women's representation in Parliament. 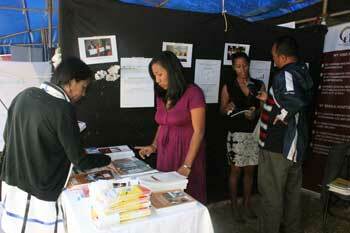 Speaking to the press during the celebration of International Women's Day 2018 in Antananarivo on 10 March she said, "Thanks to training provided by EISA since 2013, the number of women MPs has risen from 13 in 2013 to 29 at the moment". FANO DERANIAINA 2018 "Faible taux de la participation des femmes dans les sphères décisionnelles de la vie publique", Madagascar-Tribune.Com, 12 mars, [www] http://www.madagascar-tribune.com/Faible-taux-de-la-participation,23677.html (accessed May 2018). 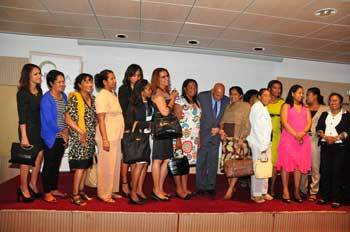 EISA Madagascar met with the Chairperson of the Senate, representatives of women MPs and Senate senior staff on 24 August. This technical meeting aimed to assess the partnership between the two organisations so far and to plan further activities to enhance performance of the institution in performing its mandate. During this meeting, the Chairperson of the Senate mandated EISA to support MPs in drafting resolutions on gender equality that will be presented by them during the next session of the Inter Parliamentary Union taking place in October 2016 in Geneva. On the occasion of the celebration of International Women's Day 2015, EISA and the Caucus of Women MPs organized an awareness day to promote and sensitize parliamentarians and National Assembly's staff on women's participation in democratic processes. This event took place on Thursday 5 March as a part of the national celebration of International Women's Day that started on 1 March and will end on 8 March 2015. Chaired by the President of the National Assembly, his from Ministries, Women's associations and some organizations from the United Nations System in Madagascar such as OHCHR or UNDP. Discussions particularly focused on the necessity to involve women in the ongoing process of national reconciliation as stipulated by the UN Resolution 1325 on women, peace and security. This is the first time that the National Assembly celebrates the International Women's Day. During his opening speech the President thanked EISA for its continued support and reaffirmed his commitment to improve Women's representation inside the lower House. 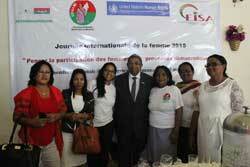 On 3 October and 2 December 2014, EISA organized dissemination workshops for the Report on gender mainstreaming in the legislative process in Madagascar (Prise en compte de l'égalité Hommes-Femmes dans le processus législatif à Madagascar). The two meetings, held in Antananarivo, aimed to share to stakeholders, including MPs, ministries, Civil Society and UN bodies working in the gender field, key findings on gender equality issues in the Parliament. The dissemination which was officially launched by the Speaker of the National Assembly, Mr Jean Max Rakotomamonjy, who praised EISA-Madagascar's initiatives to promote greater women's participation in national governance, was an opportunity to provide, for the first time in the country, a check-list to assess gender mainstreaming in a particular bill or any draft law. By giving a specific tool to MPs, EISA contributes to the capacity building of the Parliament in the gender area and helps this institution to be more effective in addressing men and women inequalities. More generally, this initiative participates to the improvement of gender considerations in the legislative process in Madagascar. 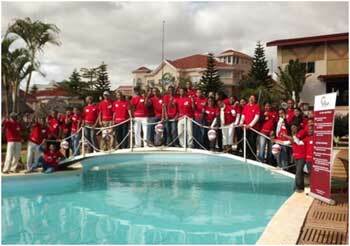 In the 23rd of September 2014, EISA was invited to the launch of the National Symposium on Gender issues in Madagascar. The event organized by the Ministry of Population, Social affairs and Women promotion and the PFOI (Women in Politics Platform of the Indian Ocean) intended to prepare the celebration of Beijing + 20. EISA was associated as a valuable and recognized organization in the gender field in the country. This is also an acknowledgement of EISA's contribution to the improvement of women participation in the decision-making processes in Madagascar. It worth to notice that EISA will be part of the organization committee of the upcoming national symposium. Pour la première fois dans l'histoire de Madagascar, une femme (RAZANAMAHASOA Christine) va prendre la présidence de l'Assemblée nationale. Mieux encore, la vice-présidence, qui compte six membres, sera composée de trois femmes (NAHARIMAMY Lucien Irmah, RAHELIHANTA Jocelyne, RAHANTANIRINA Lalao). Autre inédit, 30 députés sur un effectif de 147 élus sont des femmes. Jusqu'à présent, le taux de représentation féminine au sein de la Chambre basse n'avait jamais excédé les 10%. Madagascar est ainsi à un tournant décisif dans la quête de l'égalité hommes/femmes. 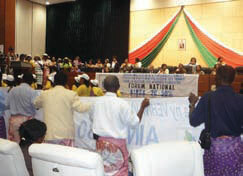 In 2013, EISA launched a new project aimed promoting the participation and representation of women in politics through increasing the number of female candidates elected in post-conflict decision-making institutions in Madagascar and strengthening women's political effectiveness in these institutions. The project bases itself on the assumption that roles taken by and given to women during a post conflict process may set the stage for them to gain experience and visibility. Women's representation in post-conflict institutions could trigger a long-term process for women's empowerment and inclusion in the decision-making process of all layers of the society. Funded by the United Nations Democracy Fund (UNDEF), the project also seeks to enhance awareness on challenging confronting women's representation in politics and public affairs and share best practices on how to address them. Sharing and dissemination of information on women in politics to the public at large. Besides supporting the "30-50% campaign" for increased women's representation in the decision-making process in Madagascar, EISA monitored local women's plans of action. One initiative worth mentioning is the capacity building workshop held for traditional leaders in the Brickaville district, in the Atsinanana region in November 2012. The activity was supported by EISA for its originality and strategic nature as it is always through traditional authorities that candidates reach out to communities during the election campaign process. The workshop's objective was to sensitise members of the community on the need to promote women's participation in politics in their communities. The high turnout of the workshop illustrated widespread interest in the topic. While only 30 traditional leaders were invited, more than 40 eventually came from all over the district in spite of the old age of some of them and the long distance others had to travel. The workshop provided a unique opportunity for participants to learn more on gender parity and share views on the current women and men's roles in traditional societies. Most participants expressed their worries vis-à-vis the changing roles of men and women nowadays and the impact on the traditional society. They also unravelled the challenges associated with this transformation and discussed their role in helping their communities respond to them constructively. After successfully concluding an agreement with 5 universities, namely University of Antananarivoy,Antsiranana, Toamasina, Fianarantsoa and Toliara to include university students in the roll out of sensitising the public on issues of greater participation of women at all levels of society as well as greater citizen participation in governance issues, students have been trained in the EISA "Strengthening capacity of women and youth to participation in decision-making processes". From January 2012 the programme has been rolled out with 65 students and 11 lecturers from all five collaborating universities who attended a workshop in Antananarivo in June. Following the June capacity building workshop, participants, with the assistance of their lecturers who coached them, drafted a three month action plan. This plan included the names of universities or faculties where they will conduct sensitisation workshops, the dates of workshops and the topics they intend to cover. Based on these plans, EISA assessed the needs for each awareness workshop and provided technical, financial and logistical support. In addition participants have established the Association of Intellectuals for the Promotion of Gender Issues as a result of the training. A coordinator has been identified from amongst the students to promote gender issues in each of the four partner universities. 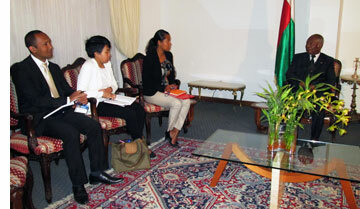 EISA is also in discussion with the University of Mahajanga in regard to possible collaboration. 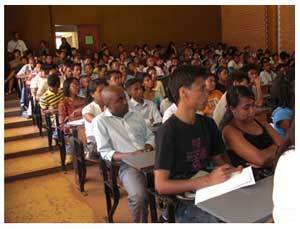 By and large, the Programme was able to achieve the establishment of a Gender Institute within the University of Fianarantsoa and the creation of the Association of Intellectuals for the Promotion of Gender Issues at each university. Other activities undertaken included a meeting held on 22 November 2012 in Toamasina with members of the Intellectuals' Association for Gender Promotion in the Toamasina province. This was meant to monitor the level of implementation of gender sensitization activities by Toamasina University students. One finding that came out of the interaction between EISA and the group was that the campaign has significantly contributed to the personal growth of the students involved in the project. Through the campaign, most students reached out seemed to be more cognisant of the need to promote gender equality at university level although engaging with female Muslim students proved to be challenging. Most of these students refused to accept the notion that the only difference between men and women is merely biological and that both men and women should have equal social roles, rights, and responsibilities. Obviously, more specific action is needed to reach out to the Muslim community owing to religious based stereotypes of their members and taking into consideration the high number of students attending the Toamasina University. Several associations have been interested in integrating the movement 30-50% in their structures and have requested EISA'S support to assist them.A strategic planning meeting was held further on the 24th April attended by all 22 VMLF regional branches and the National Bureau. Each region has defined their strategy for engaging with other associations in their regions about the VMLF, its aims, objectives and activities. To date 73 associations have been introduced to the 30-50% Campaign including female work inspectors associations, members of the police force and spouses of male members of the police force, journalists and political parties countrywide. The "Movement 30-50%" campaign was initiated by the Vondrona Miralenta ho an'ny Fampandrosoana (VMLF, a women's gender network for development) with the technical support of EISA as an advocacy tool addressed to policy-makers in support of the SADC Protocol on Gender and Development to have at least 50% of decision-making positions in the public and private sectors held by women. During the review period the Campaign has supported six regional branches to extend the campaign to their areas with EISA providing support to six of the 22 regional branches. Branches identified a range of interventions to sensitise the local population to the Campaign. For example the Analamanga region has been lobbying for the Movement 30-50% since the beginning of the transition in Madagascar. Other interventions include sensitisation of traditional leaders on gender issues, creating awareness in schools and radio broadcasts where regional representatives were interviewed and used the opportunity to extend the message to local communities. A concerted effort to engage with university students was undertaken. Consultative meetings were held with the Dean of the Faculty of Law, Economics and Sociology at the University of Antananarivo. EISA and the University have agreed that EISA will conduct capacity building workshops for students from this faculty using EISA's capacity building programme for women in decision-making processes as the basis. Students will be provided with skills and knowledge and will in turn share their knowledge with their peers. The main achievement has been the inclusion of EISA's programme in the students extra-curriculum academic course, which will ensure the sustainability of this programme. 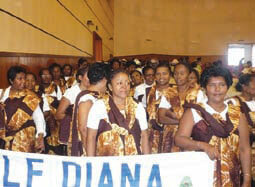 The main achievement in 2009 was the launch of a "National Plan of Action" to increase women's participation and representation in the conduct of public affairs in Madagascar. 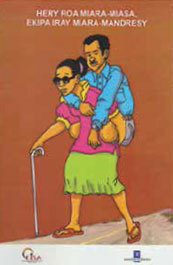 The Plan of Action has its foundation in the SADC Declaration on Gender and Development which commits member states to "ensuring the equal representation of women and men in the decision making of member states and SADC structures at all levels" and in particular calling for 50% women's participation in political processes by 2015. The National Plan of Action was launched on 26 January 2009 at a seminar at the Hotel Carlton, Antananarivo, attended by Dagny Mjos (representative of the Norwegian Embassy in Madagascar), Ms Rasoaranto Ravelonirina Dorothée Myriame, General Director of the Ministry of Health, Family Planning and Social Welfare, as well as 80 participants from civil society, political parties, international organisations, government and Parliament,from Antananarivo, Fianarantsoa, Toamasina, Antsiranana, Mahajanga and Toliara. 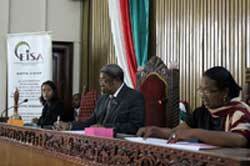 The launch of the Plan of Action followed a year of preparatory work undertaken by the VMLF supported by EISA. It was formulated following six regional meetings attended by 280 women who suggested appropriate actions to ensure that their voices were heard in encouraging greater participation of women in the constitution making processes and proposed elections. The Plan of Action took into account the recent political developments in Madagascar and included strategies for women to participate in the constitutional review and to lobby for increased representation as party candidates in the proposed elections. The Plan of Action included a strategy and road map to broaden the movement. Six regional steering committees were established to strengthen the campaign, with each of them developing a regional plan of action, taking into consideration the realities of each region and the expressed needs of the beneficiaries. The inputs from the regions determined the different activities and focuses of the VMLF (women's movement) from 2009 to 2012, where it will draw the strategy and roadmap to broaden the movement and to advocate for women's participation at all levels of the decision-making process. Design of the Plan of Action was conducted by Vondrona Miralenta Ho an'ny Fampandrosoana (VMLF), The Steering Committee, established 2007 with EISA's support and EISA Madagascar. Support from the Gender Promotion office and the Malagasy Ministry of Health, Family planning and Social Welfare was also forthcoming. In general, the Plan of Action put forward the need for behavioural and attitudinal change in men and women. More particularly, it encouraged women to take responsibility as agents of change. The Plan provided a strategy for information and communication regarding the promotion of gender equity and improvements in the standard of living of women. The aim was to interest women in public life and equip them with resources to stake a claim in decision making functions. The principles which underlie these activities refer to various international and national texts. They take as a starting point the fundamental values of, amongst others, democracy, ethics, integrity, citizen participation, accountability and parity. Encourage leaders and official decision makers and political parties to open a space for women to access structures and procedures in electoral and decision making processes. Sensitise and inform citizens and their organisations to support the advocacy of women in accessing decision making processes. Develop skills and competencies in women leaders that will reinforce their capacity. Facilitate information exchange and networking at local, national, regional and international levels. For the first time a rally for women was held in Madagascar that had as its main focus the participation of women in decision-making processes. 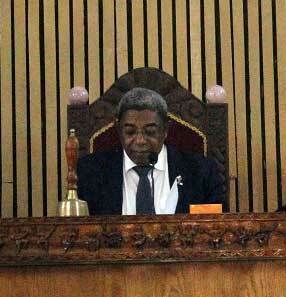 It was a real opportunity to publically call for the increase in the number of women representatives at local and national level in preparation for the forthcoming elections taking Madagascar from the third to the fourth Republic. It was also an occasion for Malagasy women to raise their voices and to advocate for the inclusion of "gender parity" in the forthcoming constitutional and electoral law review outlined in the SADC Gender Protocol. The programme initiated by the VLMF complements the launch of the Plan of Action as it builds on the commitments made through this plan. EISA supported the VMLF in conducting twelve regional meetings to broaden the "Movement's goal of at least 30% of women in decision-making positions in 2012 and 50% in 2015". These meetings were attended by more than 1000 participants in November 2009. Thereafter, a national women's rally was organised in Antananarivo in December to gather 600 women and men from 22 regions who all became members of VMLF. A national strategy to advocate for women's participation and representation in the conduct of public affairs as well as a political code of conduct for women in decision-making positions were developed and adopted at this occasion to be launched in 2010. EISA assisted in establishing a steering committee to develop and facilitate a campaign to advocate and lobby for 30% representation of women in decision-making processes. From July to December 2008, the steering committee laid the groundwork for the Plan of Action consulting with a range of stakeholders and re-formed itself into the Vondrona Miralenta Ho an' ny Fampandrosoana (VMLF), the women's movement in politics for the country's development. The VMLF, with technical support from EISA, drafted a proposal to take into consideration gender parity within the political law reform process in Madagascar, which began at the end of 2008. The proposal will be launched at a national meeting early in 2009 and thereafter rolled out countrywide. The proposal suggests the introduction of a quota system and a zebra list. A successful two-day seminar under the theme 'Gender Equity in Democratic Processes and Institutions in the Madagascar and the SADC Region' was held in May to take the debate into the public domain and to create awareness of all stakeholders on issues that hinder women's participation and gender parity in the political arena. A hundred delegates drawn from political parties, civil-society organisations, government institutions and professional and faith-based organisations participated. Speakers included local as well as regional resource people who brought to the discussion regional experiences. Topics included the impact on electoral systems of the inclusion of women in the electoral process and the role of political parties in enhancing women's representation in decision-making. A particularly positive outcome of the seminar was the agreement that a campaign for the inclusion of at least 30% of women in Madagascar political life should be put in place.